I had absolutely no idea, when I made this dish, that it is National Bacon Month. Who knew there was an entire month to celebrate America's favorite porky treat? I was merely working with ingredients I had at home, and a little light bulb that was floating around in my head. After I made my Deviled Egg Potato Salad, I immediately thought, "How awesome would this be as a BLT Potato Salad?". I mean, to me, if you add bacon and roasted tomatoes to anything you can't go wrong. Well, maybe not in ice cream. Hhmmmmm you know I might even be game to give that a shot! Yes, it is no shock that I am obsessed with tomatoes right now. I have 3 plants in my back yard. They were supposed to be 1 red, 1 yellow, and 1 grape. Wellllll it turns out that they are 1 red, and 2 grape. I guess someone thought it would be funny to switch the tags on the plants. No worries though, I love grape tomatoes and they are fabulous in salads of all kinds, roasted or not. For the "L" in the BLT I cheated a bit. I used leeks instead of lettuce, but you have to admit that a nice subtle onion flavor sounds so much better than just adding some plane old lettuce to fulfill the "L". I slowly melted them into some bacon fat mmmmmmm, oh yessss that is just what the "L" needed!! This potato salad had so many good flavors going on in it. It is deviled eggy (is that a word? ), salty, a bit tangy, with the lovely mild leeks, and smokey roasted tomatoes. It is perfect as a side to any of your grilled goodies, or as a companion for your lonely lunch sandwich, or just on it's own (which is how I will admit I eat it) My son grabbed the bowl and I was lucky it came back with anything still in it!! The kids are coming over this Wednesday for my birthday, I think I need to make another batch of this ASAP!! Meanwhile place cubed potatoes in a pot and cover with water. Bring the water to a boil and boil until tender, about 15 minutes. Drain potatoes and spread out on a baking sheet to cool. Place the halved tomatoes on a baking sheet. Drizzle with a bit of olive oil and toss them. Lay them out in an even layer. Sprinkle with salt. Cook for 20 to 30 minutes, or until the tomatoes begin to slump. Cook the bacon in a large skillet over medium heat until crisp. Place the cooked bacon on a paper towel to drain, and reserve 2 tablespoons of the fat to cook the leeks in. Place your sliced leeks into a large bowl filled with cold water, stirring them with you hand to separate the leaves and get the grit out. Use a slotted spoon, remove the leeks, shaking off the excess water. Cut the boiled eggs in half, remove yolks and rough chop the whites. Place yolks in bowl, mash with a fork, and mix with pickle relish, mustard, mayonnaise, salt, and pepper. Set aside. 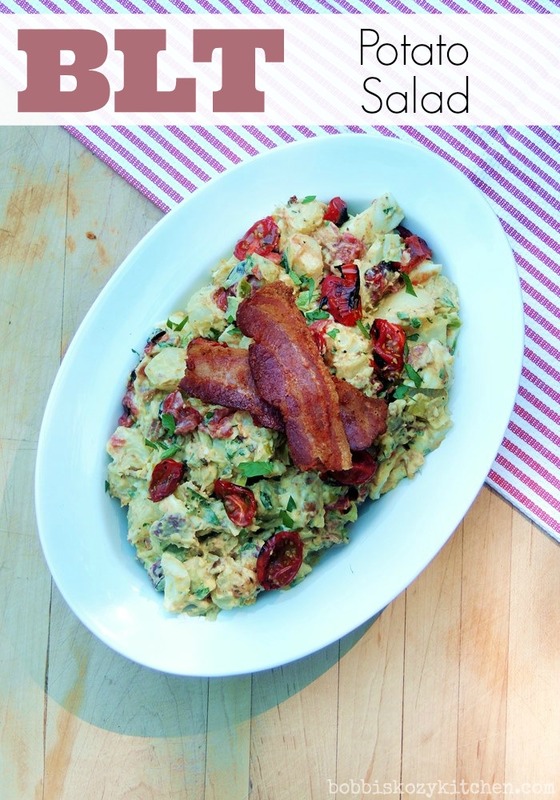 Mix potatoes with egg whites, green onions, celery, crumbled bacon, leeks, and roasted tomatoes. Add egg sauce. Combine well and salt and pepper to taste. I make something similar as MY FAMOUS potato salad. Never thought of adding bacon and roasted tomatoes. This looks delicious.